in one sentence. It isn’t just a sewing machine because it performs with excellence on quilting projects as well. The 1600P is all you will need to complete projects that require sewing, quilting, patch-working, and even upholstery. Here’s a look at this sewing machines outstanding features. Dual LED lighting of two krypton lamps. Industrial-designed lever for thread take-up. With sealed bearings on the shafts. Capable of pressure level of 11 pounds on the presser foot. Easy-to-read diagram of threading is printed on the machine’s front. Tension lever for thread is synchronized. Downloadable product brochure is available in PDF. Equipped with a metal setting plate attachment. Industrial-grade rotary hook is side-loading. Easy-to-follow diagram of bobbin winding is printed on the machine’s top. No stalling because of the foot control’s liquid response. Capable of stitch length variable up to a maximum of 6mm. Thread cutter is automatic for more convenience. Flat bed has no oil holes. Work area measures a spacious 8.85 inches by 5.5 inches. Memory for needle up and down setting. Industrial precision of pre-tension threading. Absence of external motor assures quiet operation of the machine. Presser foot comes with a sensor. Short carrying handle is foldable for convenience. Bobbin winder is independent of other mechanisms. Speed control is variable depending on the user’s need. Knee lift is ergonomically designed for a wide range of adjustments. 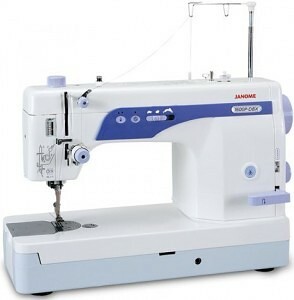 Bobbin winding and threading are considered difficult to accomplish with sewing machines but the 1600P model goes through both in a breeze. They have both tasks with easy-to-read and easy-to-follow board diagrams. Everything becomes easy as pie from bobbin insertion in its case to bobbin mounting on the machine’s race hook. Even beginning sewers will find it simple to adjust the dials for both the stitch length and tension. For a machine that runs like a heavy duty industrial strength sewing machine, the Janome 1600p-qc 390 is surprisingly quiet, without any vibration when it operates. As to durability, the body construction is of painted aluminum. This model is suitable for use by users of all skill levels of sewers and is a showcase of versatility from everyday sewing like patch-working to heavy quilting. Since this model has been especially designed for heavy duty sewing and produces amazing results even with heavy fabrics projects such as, suede purses, corduroy coats, vinyl slipcovers. One piece of HL x 5-14. Cloth guide inclusive of screw. One piece of HL x 5-9. One piece of HL x 5-16. Two pieces of HL x 5-11. Other types of thick fabric. Other kinds of synthetic fabrics. Although the 1600P model has a convenient short, foldable carrying handle, portability may be inconvenient because of the machine’s bulk. I’ve seen some customer reviews report difficulty with the automatic threading feature, but I didn’t encounter any problems with it at all. One item that you may consider a “con” is the fact that the 1600P is exclusively a “straight stitch” sewing machine. The upside of this “con,” which was also mentioned as a “pro” is that the model is perfect for projects which require long and straight stitches that it can form well, tight, and sturdy. This is why It is a popular choice with quilters. And while the machine’s speed is adjustable and can be set at 800 SPM, some users may still find this speed setting much faster, and therefore more intimidating, than their capacity to sew. Some customers on third party websites mentioned the “old-fashioned feel” of the Janome models like the 1600 due to its mechanical nature and solid, heavy frame. Quilters and other sewers have only high praise for this model because of its excellent performance in straight stitching. This, however, has disappointed those who expected features such as buttonhole creation and zigzag stitching in this model. Based on my experience, even beginning quilters will not have an issue with this sewing machine. While it has a tremendous line up of features, it is most suitable for quilters and not for other types of sewers. This is because, as mentioned elsewhere in this review, this particular model’s performance, while undeniably excellent, is limited and exclusive to straight stitching. Given that, the Janome 1600P sewing machine is a “must have” for serious or even wannabe serious quilters. The heaviness as a “con” mentioned previously should not deter you from buying this model if you are determined to do quilting on a large scale frequently. Those who want more embroidery, stitches, etc., however, should consider the embroidery machines I recommend here. Thanks for your detailed review, which helped me decide whether or not to purchase this machine. I already own a mechanical basic Janome and am very pleased with it, but the Janome 1600P may not be the best upgrade for me. I can live with the straight stitches only, but the minimum speed of 800 SPM is something that I would find problematic. A lot of my sewing (hobby) projects require less speed. I would feel like riding a bike downhill with no breaks! Just bought this machine today! Bought the grace quilt frame also after trying them out together at the store. Christmas came early!! It was so fluid and easy to use I just had to have it. After struggling trying to get quilts through my other Janome, I am looking forward to using this beauty! I’m partly handicapped in one hand/arm and I liked that the controller could be moved right or left, this is going to make quilting so much easier for me! So quiet too! ( now I can sneak into my sewing room at night to sew and it won’t wake hubby,lol! ).